Listened to a sobering interview yesterday on NPR’s Diane Rehm Show, with Craig Simons, author of the new book, The Devouring Dragon, which chronicles China’s insatiable appetite for natural resources – an emerging global threat to biodiversity and water and air pollution. This story should make us all take pause. China’s rise is assaulting the natural world at an alarming rate. In a few short years, China has become the planet’s largest market for endangered wildlife, its top importer of tropical trees, and its biggest emitter of greenhouse gases. Its rapid economic growth has driven up the world’s very metabolism: in Brazil, farmers clear large swaths of the Amazon to plant soybeans; Indian poachers hunt tigers and elephants to feed Chinese demand; in the United States, clouds of mercury and ozone drift earthward after trans-Pacific jet-stream journeys. Craig Simons’ The Devouring Dragon looks at how an ascending China has rapidly surpassed the U.S. and Europe as the planet’s worst-polluting superpower. It argues that China’s most important 21st-century legacy will be determined not by jobs, corporate profits, or political alliances, but by how quickly its growth degrades the global environment and whether it can stem the damage. Combining in-depth reporting with wide-ranging interviews and scientific research, The Devouring Dragon shines a spotlight on how China has put our planet’s forests, wildlife, oceans, and climate in jeopardy, multiplying the risks for everyone in our burgeoning, increasingly busy world. From tens of thousands of diseased pig carcasses floating in rivers used for drinking water to consuming half of the world’s coal production, China is an environmental disaster in the making. China’s pollution is even affecting the U.S. homeland. Research by Dan Jaffe, a professor at University of Washington, has revealed that air quality on the United States’ West Coast is being impacted by air pollution from China. Amidst this somber news, however, is a wee glimmer of good news of a growing environmental awareness and concern by a health conscious middle-class and civil society that has increasingly pushed for positive change. Not a moment too soon I might add. The Chinese government too is keenly aware of the problem and is slowly awakening to the need for new laws to discourage illegal pollution and to encourage the adoption of cleaner technologies. 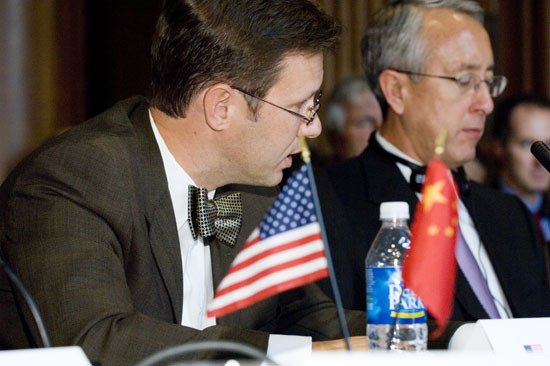 Here I am during one of two Chinese delegations to the U.S. while I was at EPA, where Chinese authorities visited with government authorities and water technology providers to explore legal and technical solutions to major water pollution issues confronting their homeland. I have no objection to others’ proclivities to consume to excess, provided such excesses do not pollute my water, my air, or threaten my children’s future. Liberty is rooted not only in the veneration of our traditions but the concern of our successors.